Voice For The Voiceless: Really Now DP? Diana Peters you have been caught in another LIE, this makes the total Lies estimated of 765 in total. You are going to Hell for all the scams you have pulled the people you ripped off. And for what? To line your pockets with money to pay YOUR RENT, and get your Cigarettes and Booze. What about the dogs Diana? You are putting their lives on the line for your petty greed. Get a Job and stop this insanity. Which is it, Acre or Quarter Acre? First it was 4 then it was 3 then 2 now it's a Quarter. Unbelievable. 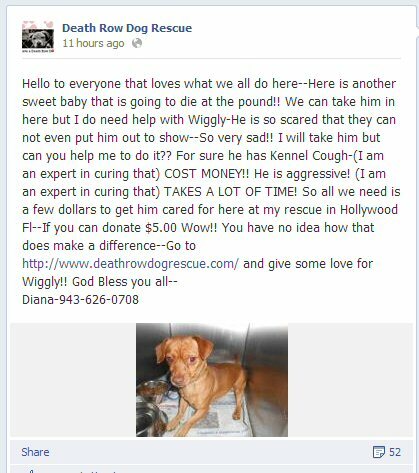 By the way his name isn't Wiggly, it's Wubbzy and he is still at MDAS. 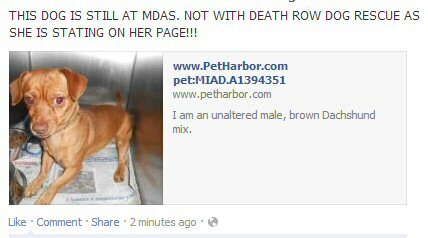 And here is the APPROVED RESCUES LIST that MDAS allows. Don't think I need to say anymore.